note: this is part 3 of a multi-part series i'm writing to cover all of my thoughts on doping. you can check out part 2 and part 1. there'll be more parts. The previous posts in this series dealt with the motivations driving athletes who cheat using performance-enhancing substances (reference: part 1: the easy way) and the types of doping and means of deception they use (reference: part 2: doping, drugs, & deception). This post is directed at noting how the issue of cheating via performance drugs involves complexities that make it more difficult to resolve than many might perceive. Superficially, and even at its core, the issue of doping revolves around the premise of catching "cheaters" who cheat by using performance-enhancing substances to boost their athletic performance. It is upon this premise that so much of anti-doping efforts are directed. It is a clear-cut mission, with an identifiable goal, and with a bright-line defining criteria. For all appearances, it seems a very straightforward (i.e., simple) process. Each of these are dealt with individually below. Many of the substances involved with performance enhancement have medicinal uses. Steroids, for example, are frequently administered post-surgery because of their ability to accelerate regeneration of body tissue. Because of their medical applications, the list of banned substances are not always so difficult to obtain, but can often be readily found in prescription and non-prescription medication or in commonly available over-the-counter nutritional supplements. The reasoning for such access is that people who are ill should have the right to acquire medical aid to ease their illness, and those seeking to preserve their health should have the ability to utilize products that do so. 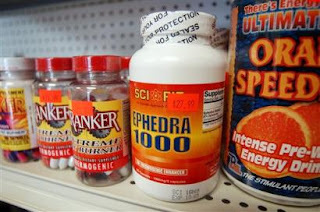 Examples of these include ephedra, a banned stimulant often featured in most medically recommended asthma inhalers, and androstenedione, an illegal anabolic drug sold as a nutritional supplement in many health-food stores. Given their medicinal value and the subsequent preference for their availability, performance-enhancing drugs cannot be so easily dismissed. An absolute ban that illegalizes and punishes all applications of a drug means not only suppressing its usage in sport as a performance enhancer, but also the denial of access to it as a medical treatment. This poses an ethical issue, since it is ethically questionable to deny access to a medically valuable drug to patients needing medical treatment--and even if those patients are athletes, they are still patients deserving of medical treatment. Gatlin's sentence for his 2nd doping violation factored in his 1st doping violation. But his 1st doping violation occurred because the positive test reflected medication he was taking to treat Attention Deficit Disorder (ADD). He received a brief ban for the 1st violation, even though the stimulant was needed to treat his ADD. In order to have avoided the punishment, he needed to have stopped treatment of the disease. This story points the way to all sorts of uncomfortable scenarios. Should an athlete receiving treatment for schizophrenia or bipolar disorder be expected to suspend their treatments long enough to clear their system of banned substances used in their medical treatment? Should an athlete who is HIV+ be expected to do the same? Is this ethical? Is this humane? Conversely, can sport really allow athletes undergoing treatment to compete if the treatment involves side effects that enhance their performance? Is it fair to other athletes that a competitor gains an advantage over them, simply because of a medical condition that requires a drug with performance-enhancing properties? These opposing questions are not easily resolved. Either way, they lead to disturbing implications. Performance-enhancing drugs are open to the risk of mistakes by laboratory tests conducted by anti-doping authorities investigating for the presence of illegal drugs. This poses a number of classic issues posed from criminal justice. The obvious one is just how many innocent people are being falsely convicted and wrongly punished (and just how many lives are being incorrectly, perhaps tragically, destroyed). Another issue is if mistakes in conviction and punishment point to excessive carelessness or maliciousness in the justice system, both of which are antithetical to the basis of justice. A deeper issue is just how many mistaken cases of innocent people are we willing to accept so that we can maintain a system that presumably also catches real criminals (i.e., the law school hypothetical is: are we willing to keep a system that catches 9 criminals but also mistakenly gets 1 innocent person?). There are no easy answers to these questions. Mistakes are also possible by athletes who unknowingly consume products with illegal drugs in them. Currently, anti-doping measures largely place athletes under strict liability for performance-enhancing drugs, in that athletes are liable for using a performance drug even if they did not know a product they used contained that drug. This requires that athletes shoulder the sole responsibility for knowing the ingredients of every item they use. The list of banned substances can be long and obscure to a layperson (for example, sample the WADA Prohibited List, available at: WADA Resources for Anti-Doping Organizations), and it is an excessive devotion of time and energy for an athlete of average sophistication and means to exercise diligence and analyze the ingredient composition of every medication, supplement, food, or drink an athlete might consume. The ingredient lists on consumer products--prescription and non-prescription--are not always truthful. The ingredient lists can be incomplete, since government standards tend to require listing of those ingredients which surpass a certain minimum percentage of the product's mass or volume--percentages which may well exceed those allowed by anti-doping requirements. The ingredient lists can be inconsistent, since laws regarding their contents vary from country to country, meaning that a product may list certain ingredients in 1 country but then omit them in another. These factors make it difficult for athletes to exercise their due diligence over the contents of products. While the simple answer would be to exercise a precautionary principle of avoiding products with unknown ingredients, this is unrealistic: it is one thing to avoid unknown medications and supplements, but another thing entirely to avoid unknown foods and drinks--a human being needs nourishment, and has to eat and drink sooner or later. Even if punishment is still deemed necessary for mistakes in athlete consumption, it still poses an issue in that it results in equal sanctions for both ignorance and malevolence. That is, it makes no difference in punishment between those athletes who tested positive as a result of mistakenly using an illegal substance and those athletes who tested positive as a result of knowingly using illegal substances. This is questionable justice, since there seems a self-evident difference in degree between someone who was simply clueless about a drug versus someone who was intent on using it. It seems the oblivious nature suggested by cluelessness deserves at most admonition, while the malevolent nature displayed by intent is the one worthier of greater punishment. Anti-doping measures largely involve tests that gauge the concentrations of banned substances within an athlete's body, with tests being labeled positive when a concentration is found to be above a particular standard. This means, however, that an assumption is being made as to what is standard. Not all human beings conform to standards, and there are always those individuals who are outliers (i.e., extremes) who fall outside the ranges considered standard or average--and who do so naturally (i.e., without performance-enhancing drugs). Some individuals have congenital conditions that do not match the average human population. Particularly with athletes, whose seemingly superhuman capabilities are arguably based on their genetic endowments (e.g., the better endurance athletes have often been noted as having above-average, and frequently exceptional, heart and lung capacities). In which case, a positive test result indicating high levels of a performance-enhancing chemical may not really be proof of cheating, but rather instead proof of a person's genetic makeup regarding their own body's chemistry. To summarize the press release, Rutger Beke was initially suspended for testing positive for EPO following the 2004 Zwintriathlon in Belgium. In the press release, Note Fact #2, wherein he notes that his family has a genetic predisposition for abnormally high levels of EPO. As a result, he argues that the positive test result was accurate in showing a high concentration of EPO, but that this is not because of doping, but instead because of his inherited family genetics. It was in part because of this argument that his suspension was later overturned and he was cleared of any guilt. As alluded to above, anti-doping methods tend to rely on tests measuring concentrations of illegal substances, with test results being labeled positive indicators of doping if the concentrations surpass certain standards. The issue produced by this is that it affects the definition of cheating, as well as the lives of people who are subsequently identified as cheating. If the definitions of cheating are so arbitrary, it suggests that a person who is innocent at one time may be guilty at another. This offends the notion of fairness, because it means that an athlete may be labeled as a cheater not because of their intent but instead because of the whim of another party. This returns to the question of intent raised in the discussion of athletes mistakenly consuming performance drugs. Arbitrary definitions of cheating mean that athletes aren't necessarily being punished because of an intent to break a rule. In fact, they make it possible that athletes may be punished even if they thought they were following a rule. For example, an athlete may be taking prescription medication with side effects that enhance performance, but doing so in concentrations meant to comply with anti-doping guidelines. If the athlete is oblivious to guideline changes that lower the standards of acceptable concentrations, that athlete may find themselves suddenly tagged with a positive (i.e., illegal) test result, and suddenly faced with punishment. This type of scenario seems inimical to the notion of justice, because it opens the possibility of punishment against the innocent, or at the very least the ignorant. Justice, and punishment, should be more about the malevolent--those who had the intent to cheat. Given the complexities presented, it seems daunting to believe that there is any way to catch cheaters using performance-enhancing drugs, or if there really is such a nefarious thing as cheating at all. For all the empirical measures, for all the claims of objective testing, and despite all the efforts as specific bright-line criteria, it is clear that issues cloud the aspirations of anti-doping institutions. Ironically enough, the defining factor in determining cheating may be drawn from the issues presented introduced in the discussion above. The common thread between all of the 5 presented (medical use, mistakes by authorities, mistakes by athletes, congenital conditions, and arbitrary definitions) is essentially one of intent--that is, if the athlete connected to drugs used them with the intent to boost their own abilities or gain an advantage over competitors. Medical use, even if to treat an illness, is still contrary to the spirit of sport if the athlete does so with the purpose of increasing their performance. Along comparable lines, mistakes, whether by authorities or athletes, point to greater innocence (or at least, lower liability) relative to athletes who use drugs with an intent to cheat. Likewise, congenital conditions are disassociated from drug use, and hence delineate the differences in danger to sports posed by those without intent and those with intent to cheat. Similarly, arbitrary definitions highlight that the danger is not who is caught using drugs, but rather who had the intent to use drugs to elevate their abilities. Of course, determining intent is a difficult challenge. It is not something readily observed and it is an elusive quality to prove. But it is no more challenging than the complexities described in this post. As suggested here, it is overly simplistic to conceptualize anti-doping measures as purely revolving around the premise of catching "cheaters" who cheat by using performance-enhancing substances to boost their athletic performance. Contrary to such a premise, anti-doping is not a clear-cut mission with an identifiable goal or a bright-line defining criteria. Instead, anti-doping is about investigating the minds and characters of athletes, and from there reading there intent to violate the spirit of sport. Anti-doping, in short, is about human nature, and all the complexities it entails.